Staff: How do I Submit an Expense Claim? As a member of staff, you're able to submit expense claims for your admins, manager or expense approvers to review and process. Firstly, go to your profile and click the Expenses tab. At the top of this page you will see dates for when the expenses must be submitted by and when they are estimated to be paid, according to your office's expenses cycle. NB: If the office expense cycle is set as “ad hoc” then no submission or payment deadlines will be shown here. Click on New expense claim. A new page will load with three tabs to complete: Expense Claim, Receipts and Mileage. Here you can enter the basic details of the claim, including the Claim title, the Client that should be claimed against and the Date that the expense was made. If the claim is for expenses across multiple days, click the Claim is for more than one day link. This changes the fields to show a Start date and an End date. This can be changed back using the Claim is for one day only link. Here you can upload any relevant receipts as proof of the claim. This will bring up a new dialog where you can enter the details of the receipt. 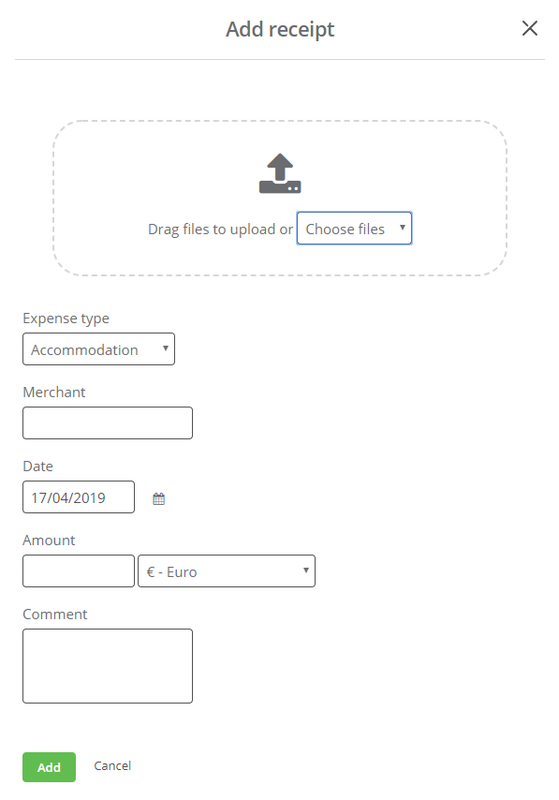 Here you can enter the Expense type, which will come from the list in your Company settings, the Merchant that was purchased from, the Date of the receipt and the Amount that was paid. You also have the ability to upload a copy of the receipt as additional proof of purchase, and add a relevant Comment. When the receipt has been added, you can see this in the list on the Receipts tab. If needed, you can Edit or Delete the receipts by hovering over the row and using the buttons to the right-hand side. Here you can add any mileage that is relevant to the claim. First, click the + Add mileage button. This will bring up a new dialog where you can enter the details of the mileage. 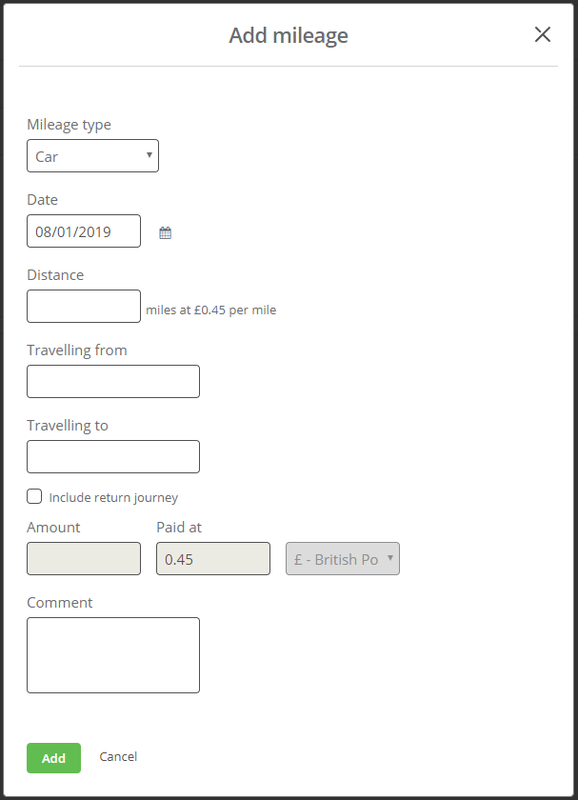 Here you can enter the Mileage type, which will come from the list in your Company settings, the Date of the mileage, the Distance that was travelled, where you were Travelling from and Travelling to and add a relevant Comment. You can also see the rate that this will be paid at. 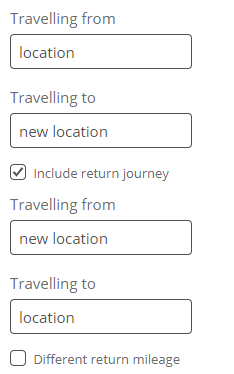 If this claim needs to include a two-way journey, check the Include return journey box. This will show additional options. NB: The return journey automatically swaps the original Travelling from and Travelling to, but you can edit these if necessary. 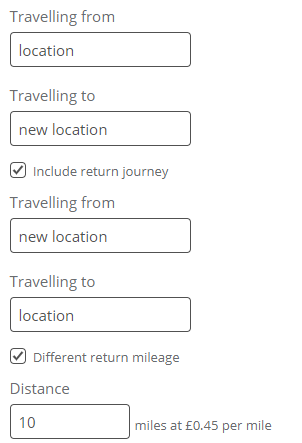 If the mileage for the return journey is different to the outward journey, check the Different return mileage box. This will add an additional Distance field. Once added, if needed, you can Edit or Delete the mileage by hovering over the row and using the buttons to the right-hand side. When you have finished adding all required receipts and mileages, you can submit the claim by going back to the Expense Claim tab and clicking the Submit button at the bottom of the page. NB: If you submit a claim without a receipt or mileage attached, you will see a warning message to notify you of this. You can still process the claim if necessary by clicking the Save button. How do I set Expense Reminders? How do I set my Expense Cycle and Currency? How do I set Additional Expense Approvers? What Happens when I Submit an Expense if I have Multiple Offices? How do I Export Staff Expenses? How do I Duplicate an Expense Claim?